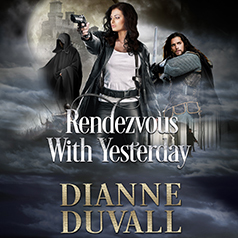 Dianne Duvall presents the second installment in her Gifted Ones series. As Lord Robert, Earl of Fosterly, attempts to identify and track down the nameless enemy who has been plaguing his lands and people with violence, the most peculiar woman stumbles into his path. Small, vulnerable, yet possessed of a bold, fiery spirit and wicked sense of humor, she persists in dubbing Robert and his men members of something called a medieval reenactment group—until she sees his castle and labels herself mad. It seems bounty hunter Bethany Bennett has come to him from the future, bringing with her laughter and chaos, swiftly winning the hearts of his people and inspiring within him a love he thought he would never experience again. But when Robert discovers a way for her to return to her time, will the love they share be enough to keep them together?